Family owned Thai joint with a small market attached. The menu doesn’t appear vegan, you have to request no eggs, no fish sauce, and then voila! Vegan friendly. Pad thai and curries are easily veganizable. This place is cute. I admired the tchotchkes on the shelves. The service was friendly but pretty slow. I wouldn’t eat there if I was in a rush. But the pad thai was pretty awesome, and I really dug the texture of the tofu. Crispy outside, chewy inside. I also loved the rice paper spring rolls, lots of fresh herbs, tofu and a perfectly spicy sweet dipping sauce. One thing I want to mention about this place is that it is cash only (or at least it was when I went there last). 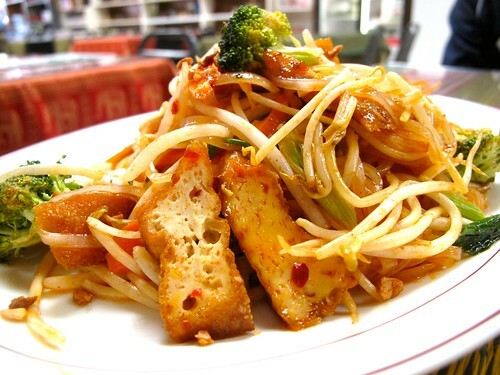 They have fantastic spring rolls and their pad thai is, when veganized, big enough to split. Plus, you’re only a couple blocks away from a few thrift stores when you’re done eating!